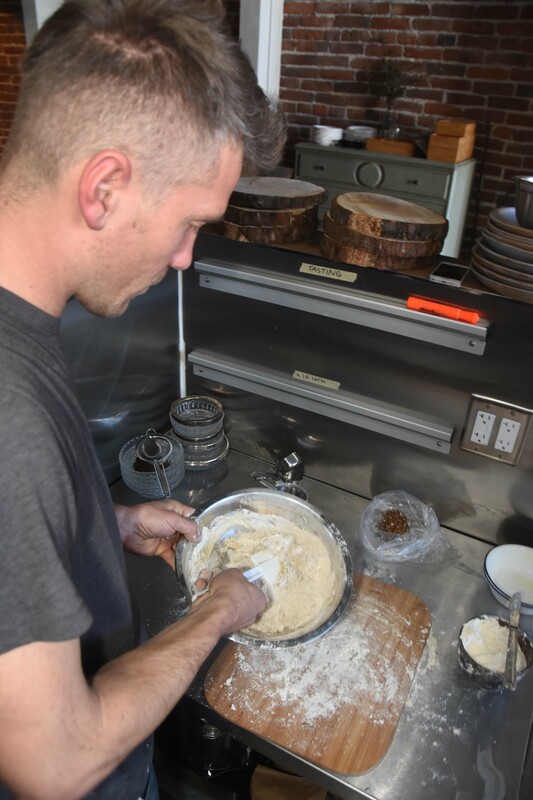 The Naked Pig might well be the smallest restaurant in Santa Rosa, though the tiny kitchen hasn’t cramped the style of the owners, Dalia Martinez and Jason Sakach, a husband and wife team, who bounce culinary ideas off one another and love the work that they do. That’s apparent to anyone who watches them cook and listens to them talk about food, usually with gusto. The size of “The Pig” hasn’t troubled loyal customers who have flocked there ever since it first opened in 2014. Over the past few years, it has expanded the culinary options in Santa Rosa with hardy sandwiches, colorful salads, coffee, tea and more. Now, Martinez and Sakach have opened a second restaurant where the artistry and the attention to details are equally remarkable. They’ve done it sustainably, through hard work and by saving money, not by taking out loans or by finding financial backers. Dalia Martinez is the chef and the creator of the food and menu concept of the new restaurant at 640 Fifth Street in Santa Rosa, while Jason Sakach is the owner who steps up whenever something needs to be done. Beef bones simmering in large pot on top of stove. Their new place is called “Flower + Bone ” and it’s true to its name. 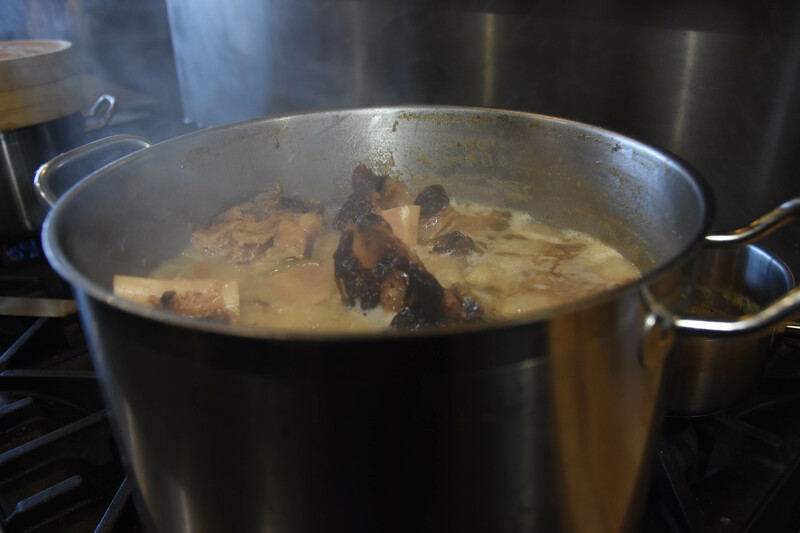 Beef bones are almost always simmering in a large pot on the top of the stove. The beef broth is used in a variety of dishes. Flowers decorate and enhance many of the dishes. The high ceiling at Flower + Bone provides a sense of spaciousness, and the long brick wall that runs along one side of the room adds warmth. 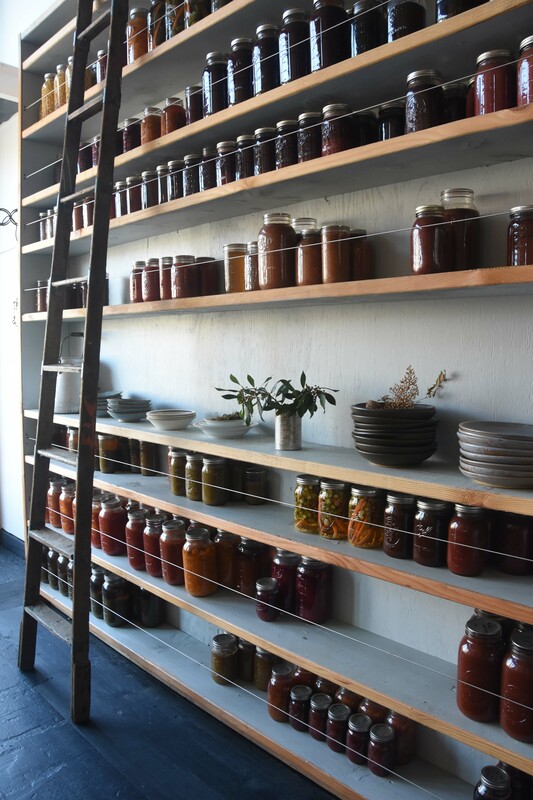 Then, too, the shelves at the front of the house that are laden with homemade preserves, relishes and sauces are reminiscent of a well-stocked pantry on a working farm. Naturally, Martinez and Sakach make all of them. 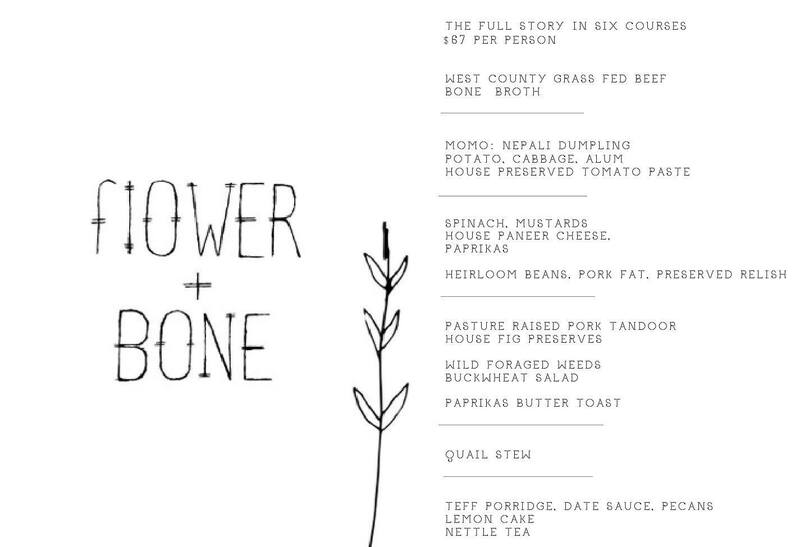 From a culinary point of view, Flower + Bone sits on a continent far away from the Pig. Indeed, if The Pig offers downhome American food – ham, eggs, biscuits, and waffles, for example – Flower + Bone serves up the kind of cooking you’d be fortunate to find in remote regions of the world. Some of the outstanding dishes include: tandoori chicken; flat breads prepared in an clay oven over hot coals; a yogurt plate that comes with a shallot-infused olive oil, along with baby carrots for color and contrast; and a California version of saag paneer, the classic Indian dish, that Martinez prepares with her own in-house cheeses and tender spinach leaves from the Ortiz Brothers Farm, just a short distance away by car or truck, on Bellevue Ave. 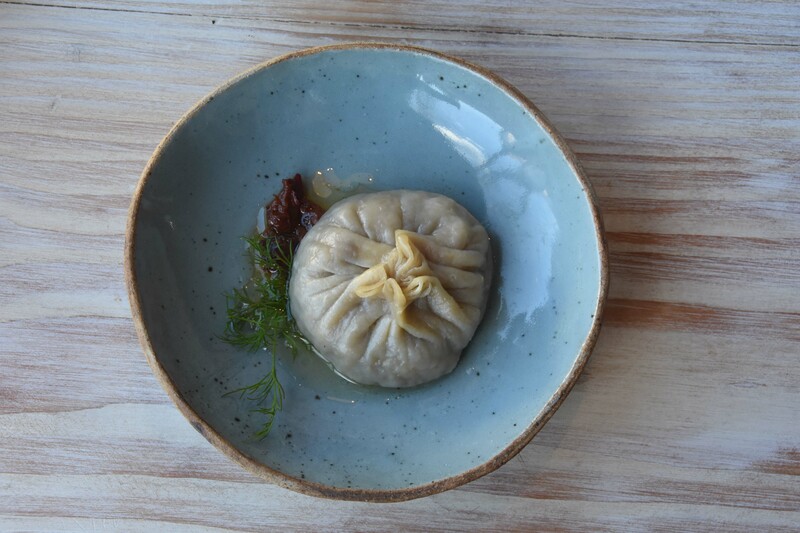 There are also the exquisite, Nepalese-style dumplings, known as “momo,” that are handcrafted and filled with chopped cabbage, potato, garlic and onions. That respectful approach to ingredients carries over to everything that’s prepared in the kitchen that boasts a stove with 10 burners and two ovens. The contrasts between “The Pig” and “The Flower” are dramatic, though the two restaurants have a great deal in common. Both make abundant use of produce that’s local, seasonal and organic. 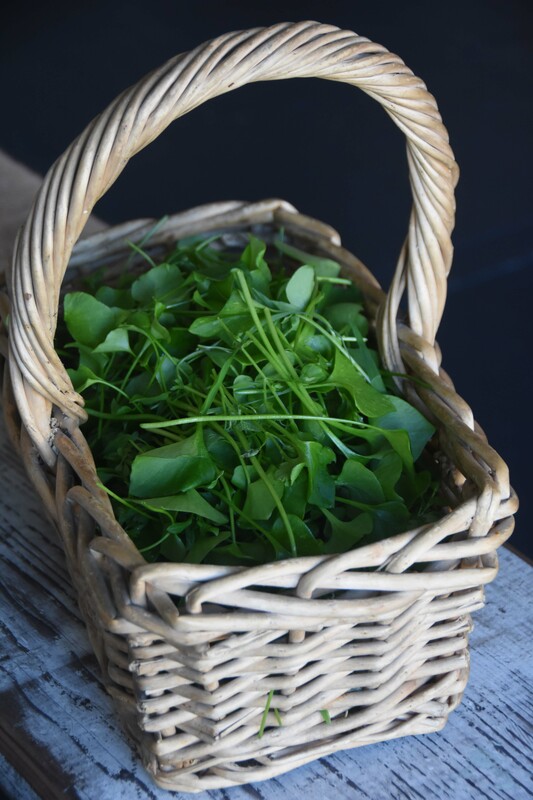 Like the spinach that comes from Ortiz Brothers Farm, almost all of the vegetables, fruits and meats, as well as the Straus yogurt and the honey from Healdsburg, are locally sourced. 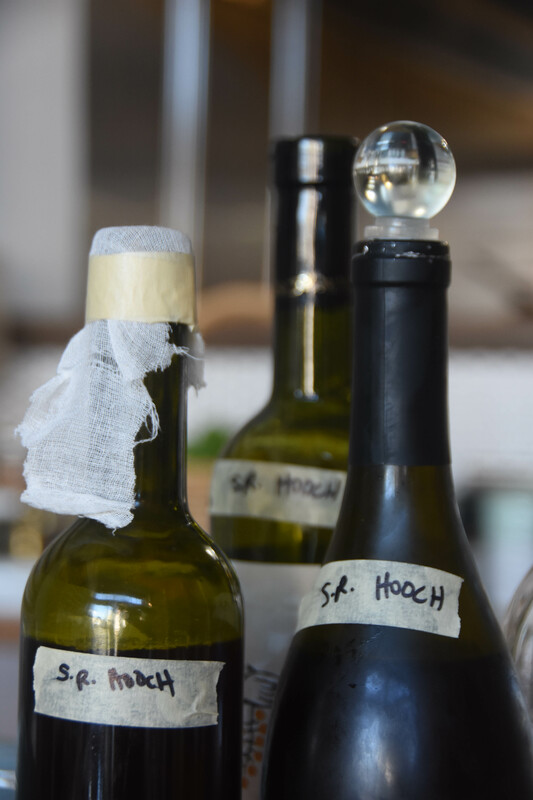 Not only have Martinez and Sakach developed close ties to Sonoma County purveyors, they also roam their own Santa Rosa neighborhood and forging for edible plants that can be used for cooking and as fuel in the clay oven. Their overarching philosophy, if you can call it that, is one that respects and aims to grow and nurture the community where they live and work on the edge of downtown with its banks and shops. At Flower + Bone, very little if anything is wasted. Martinez and Sakach recycle. The food, which is attractive to the eye and that’s delicately seasoned, demands to be eaten slowly. Rush through dinner and you’re likely to miss subtleties. Even more than the old place on Santa Rosa Avenue, the new place on Fifth Street is meant for members and followers of Slow Food, their friends and family members. The dishes are to be shared in much the same way that dishes are shared, family style, in Indian and Chinese restaurants. Martinez and Sakach call their approach “meze.” The term and the concept both come from Greece, Turkey and the Baltic states like Bulgaria where friends and family members sit around a table, share small plates and converse. 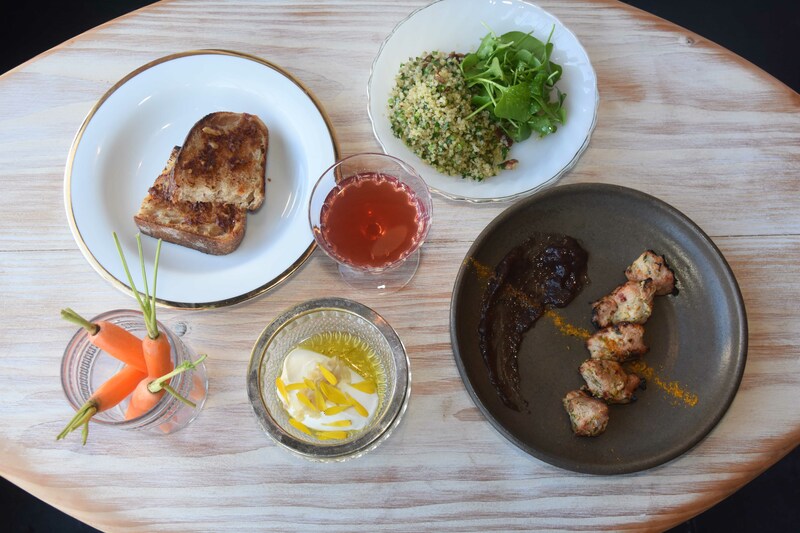 Flower + Bone is meant for anyone and everyone who doesn’t want to wolf down, say, the buckwheat salad, the foraged wild greens, the lemon cake and the porridge, which is served as a desert and that’s made from teff, a nourishing grain recently introduced to the U.S. The dish-wear is attractive and the background music just right for easy listening. Is everything perfect? Probably not! The flatbread needs work and the bathroom at the back of the restaurant could use a coat hanger and a fan that doesn’t make a racket. But the food tastes clean, fresh, and exotic in the sense that it’s inspired by the cuisine from a far corner of the world. Bryce Hansen lends a hand in the kitchen. Jesus Millan and Ali Dotti work the dining room and seem to know exactly when to bring the plates to the table and how much to say or not to say. They know what they’re talking about when they do talk the food they serve. Then, too, with an eye on fairness, tips are shared by everyone who works at the front or the back of the house. 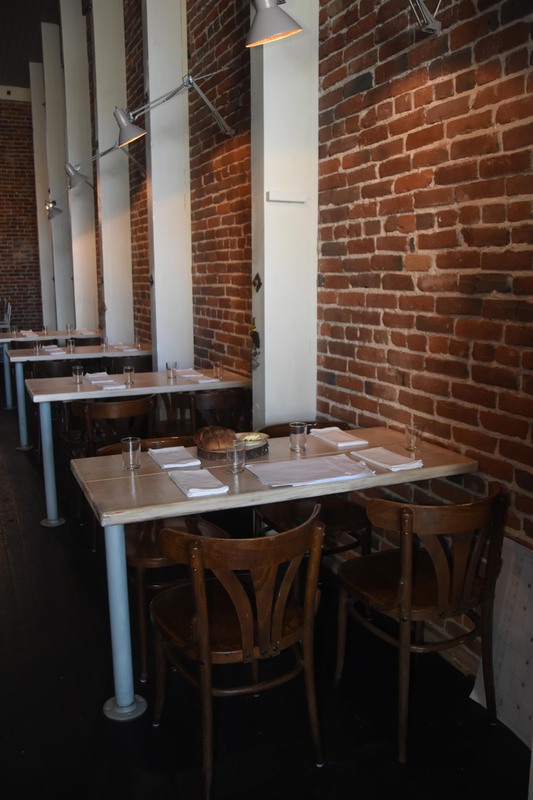 Like many new restaurants, Flower + Bone has developed slowly and steadily. 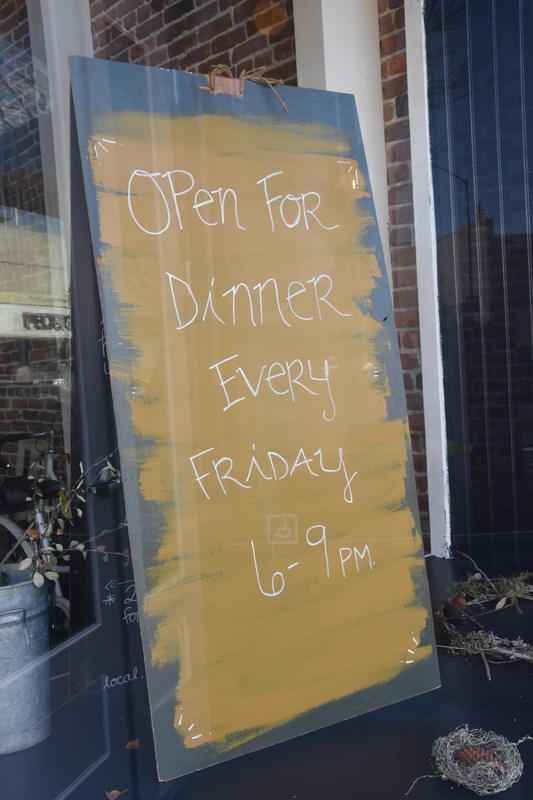 Officially, it opened in 2017, but for nearly two months at the end of 2016, Martinez and Sakach experimented with several menus — five of them in fact — and an array of dishes including wax bean salad and spelt toast with smoked lard, that has not made it to the current menu. Perfectionists, or at least finicky, Martinez and Sakach seem to be happy with their new culinary game plan, though they say that the menu will change every week and that it won’t always offer the same dishes. They reserve the right to try something different when the spirit moves them, which means that surprises are likely. The origins of Flower + Bone go back years. 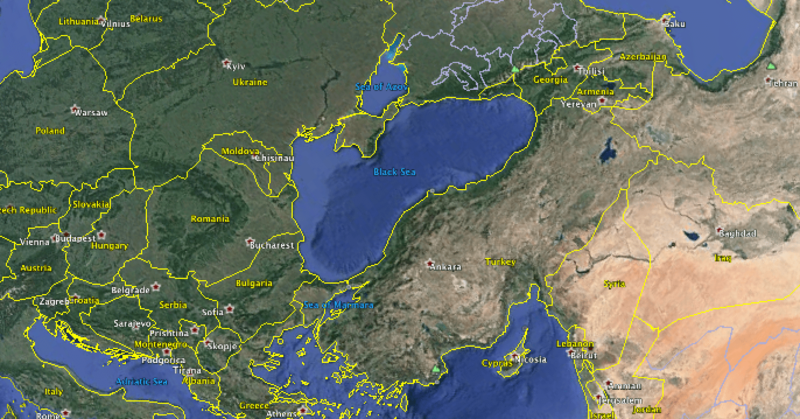 In 2013, Martinez and Sakach traveled across Georgia, Turkey and Armenia, eating wherever they went. In 2015, they explored Serbia, Bosnia and Montenegro, and rarely if ever missed a meal. Then, too, before she met Sakach, Martinez traveled to India, China and across Europe, eating in restaurants, sampling the food bringing home memories of flavors, and a cornucopia of ideas about what to cook, and how people might eat together, share dishes and take part in conversations about food and wine and everything else under the sun. 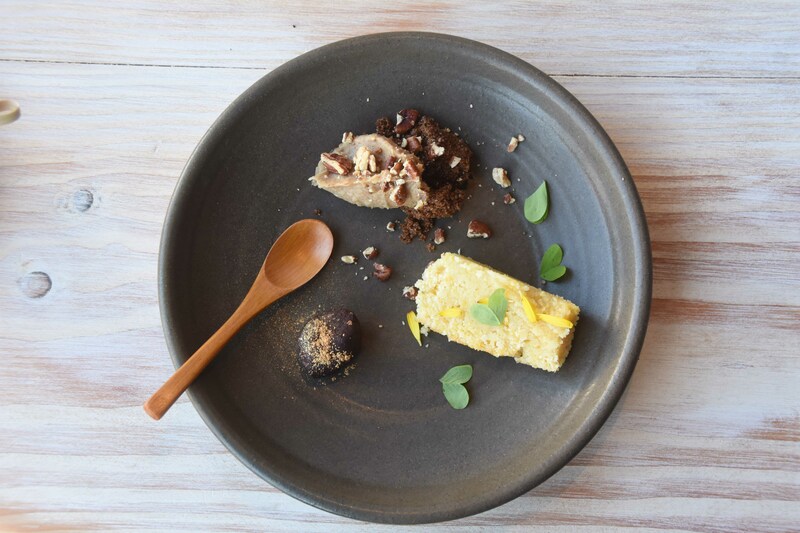 The dishes at Flower + Bone pay homage to the diverse kinds of cooking that have developed over the course of centuries in a remote corner of the world that has been defined, in recent history, by civil wars, refugees and social upheaval. That corner of the world is at a culinary crossroads that connects Eastern Europe to Central Asia. At Flower + Bone you can order the tasting menu that’s referred to as “The Full Story,” and, while it’s made up of small plates, it’s a real feast. At $67 a person it’s well worth the price. 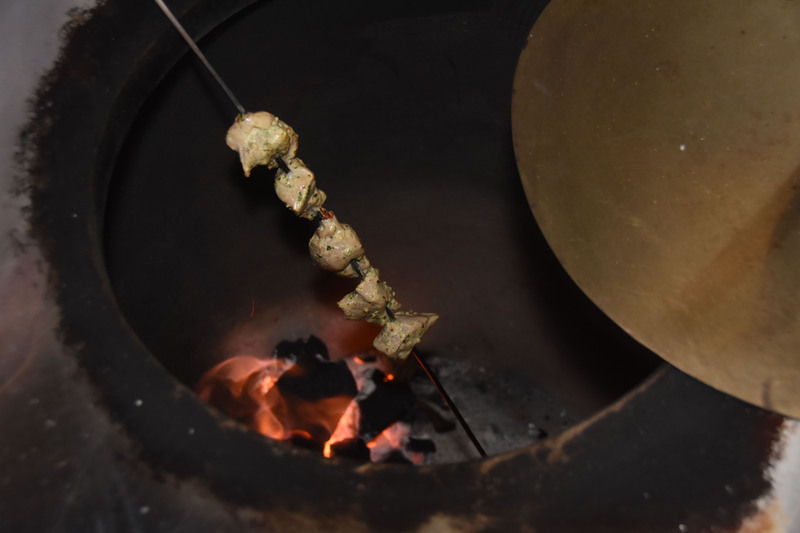 Or order individual items such as the tender, succulent pork tandoori and the buckwheat salad that ad up to $30. Flower + Bone offers delicious hooch, and while there’s nothing illicit about it, there’s an underground feel about the place. That’s the way Martinez and Sakach want it. Flower + Bone, 640 Fifth Street, Santa Rosa. 707. 708-8529. Jonah Raskin is the author of Field Days: A Year of Farming, Eating and Drinking Wine in California, and a member of Slow Food Russian River and its Media Team. Featured photo by Flower + Bone. Other photos by Karen Preuss. Karen is a Board member of Slow Food Russian River and contributes to the work of its Media Team.